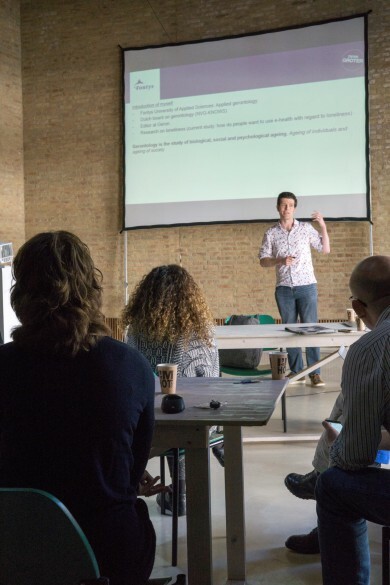 How can games improve the social ties and living conditions of unaddressed audiences in Eindhoven? In a city that is increasingly relying on technology to connect to its citizens, how can those not participating in the tech-craze be reached? This particular topic shaped the talk show held during the Data Studio and Games for Cities Game Jam on the 22nd of March at the Designhuis in Eindhoven. Unlike the previous talk shows in Amsterdam and Utrecht this was more of a briefing informing the parameters of the subsequent game jam. Nevertheless, this briefing saw the clash of data deserts, preconceptions, and game parameters, resulting in new insights into games for cities. 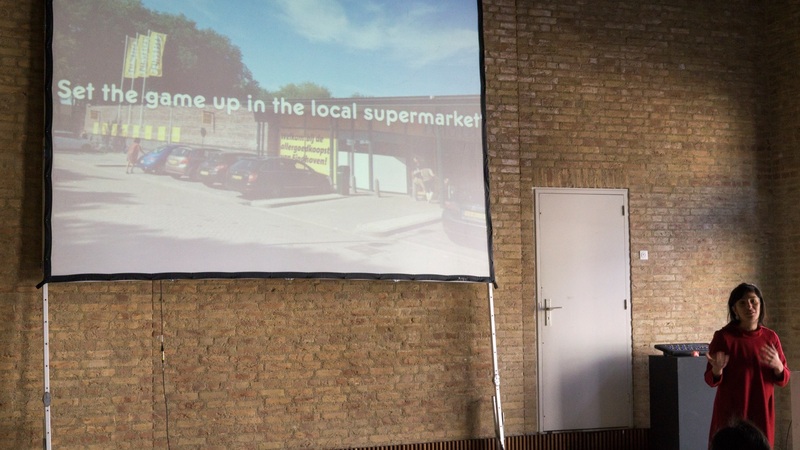 Talking about Eindhoven’s aging borough Woensel Noord, several speakers elucidated different aspects that together informed the jam’s challenge. 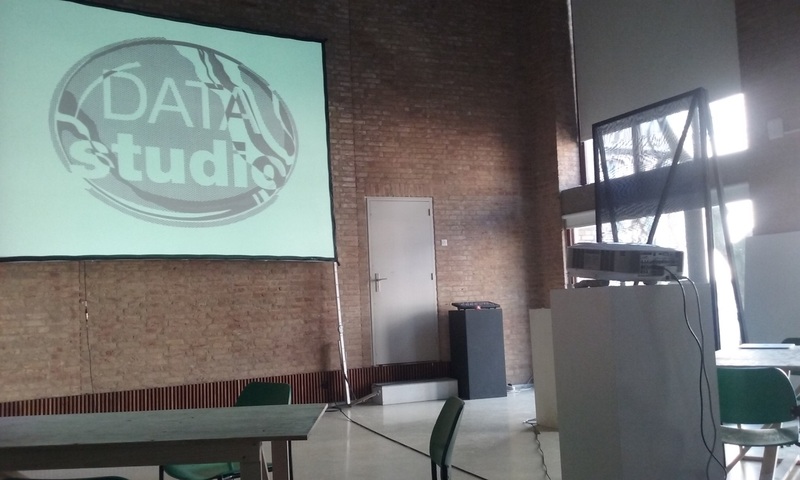 Linda Vlassenrood, of the DATAstudio, introduced the pitfalls and virtues of data. 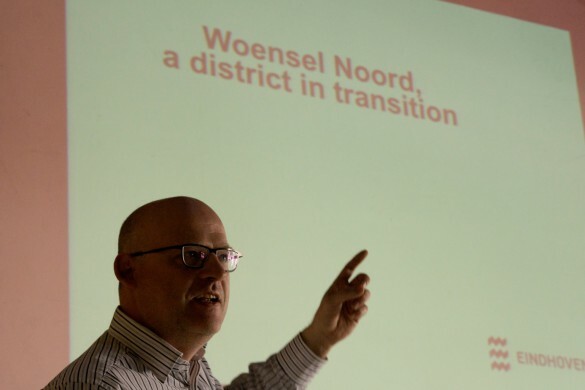 Henri Koolen, district manager of Woensel Noord, introduced the locus of the games. Eric Schoenmakers, gerontologist from Fontys university of applied sciences, clarified the gamified theme of loneliness. Maaike Mul from the Vitalys caregroup introduced existing elderly activities, and finally Ekim Tan briefed those present on the capacities of games. While these insights relate to more general contexts, the game jam and talk show focused on the Eindhoven neighborhood of Woensel Noord, and in particular Woenselse Heide and de Tempel. District manager Henri Koolen (pictured above) explained that the neighborhood in question lies in the north of the Dutch city of Eindhoven. During the 1960s and 70s Eindhoven experienced fast growth due to the increasing success of the Philips company, the technical university and the Defense department. Most of the expansion happened into the neighborhood of Woensel. This expansion was facilitated by Phillips, whose organization provided housing, facilities and amenities for many of its employees. As such, the neighborhood was built with a focus on labour: large roads catering to the commuting laborer, a few family institutions like schools but with most of the planning centering on housing the laborer while his/her (mostly his) shift was over. This was sufficient while Woensel Noord housed mostly employees, but this would not remain so forever. Times change and with it ways of living and working. A major impetus for change then is that demographic changes alter the neighborhood and its function. Aging and new arrivals place the few communal facilities under pressure as life and workstyle changes. This is spurred on further through Eindhoven’s intention to become a smart city. This entails the government changing from a top down authority to a more (tech-driven) participatory society, resulting in forms of work changing and the ‘bread earner’ model of Woensel Noord becoming obsolete. The functional mismatch in Woensel Noord is not only risking the quality of life of the older dults but it also thwarts the larger schemes of Eindhoven. The city is working hard to become a smart city, which means integrating technology into daily practices to make the city more efficient, sustainable, and improve information exchange between different parties, often through data gathering. But what if some of the inhabitants of this smart city do not use technology? An often heard solution is to “just join in and be smart.” Urban Futures professor Maarten Hajer characterizes smart cities understood in these terms as “a digital upgrade to increase city efficiency without much reference to equity and social justice,” further stating that this idea of the smart city is too simplistically based on “suspect assumptions about how easily the city can be tamed” (2016, 51). Hajer’s critique points to an explanation of why older adults prefer to solve problems without technology: Sometimes a problem is imagined and blown up when a more efficient or data driven tool is made (Townsend 2013, 11). The audience, especially older adults, do not always care about this new efficiency and thus opt out. The smart city pursuit is then not always in touch with the desires of the citizens, giving rise to the question who actually is smart (Hollands 2008; de Lange and de Waal 2013). For this talk show the question became how to make the (aging) residents of Woensel Noord smart? Linda Vlassenrood of the DATAstudio, a project initiative by Het Nieuwe Instituut and the city of Eindhoven, looked at this mismatch between the problems solved through technology based on data and the actual issues that plague the inhabitants that do not use these technologies. Vlassenrood explained that the available data in general did not necessarily explain the cause of, for instance, a higher experience of loneliness or made any way to new solutions – it only showed increase age, unemployment, and newcomers. She identified certain ‘data deserts’ – gaps in the available data due to wrong gathering techniques or the inability of reaching the audience. These data deserts meant that the available data noted changes but the factors that shape these changes in the neighborhood are ignored. Vlassenrood and the DATAstudio had set up several initiatives to traverse these deserts. An essential project was the gathering of stories. Instead of relying on the profiles of technology users the DATAstudio actually went out and spoke to the inhabitants of Woensel Noord about their worries. With the simple question of “How does it feel to live here?,” the studio gathered many emotionally laden stories that expressed an aging public confronted with rising rent, an increased feeling of loneliness due to isolation from (the participatory) society, and an unease with the high rate of change of both the populace and the society/government relations. These mixed feelings were not represented in the “hard” data, gathered through electronic data gathering and mining. Instead this new kind of data, called “soft” data, is more linked to experiences, culture, and emotions (Albino, Berardi, and Dangelico 2015, 8). This soft data is essential in catering to the citizen needs but is disregarded. Granted, gathering this data is more difficult than gather hard data, but that shouldn’t mean that these deserts should remain untapped. A desert is still a bustling zone of life and opportunities. Using social data then becomes a key topic in reaching the citizens in this neighborhood. Vlassenrood admits that what is necessary for social data deserts to flourish is a streamlining of the interview procedure (the data gathering) and an upscaling of the process. The streamlining desire merits experiments to diversify the standard interview techniques. This is where games can come in handy, especially when touching on the topic of loneliness. From the initial soft data it became clear that Woensel Noord, currently undergoing change, has higher levels of loneliness. Whether caused by the death of aging peers, a changing housing market, or a feeling of not recognizing the place you live in anymore, the elderly living in the neighborhood seem to be struggling. Using a game to bring these elderly together to let them tell stories would then easily solve this problem, right? Wrong. Gerontologist Eric Schoenmakers (pictured above) explained that loneliness is not solved by simply putting a person next to another. Especially elderly or, as Schoenmakers prefers, older adults are often understood in too simplistic a manner resulting in solutions to problems they don’t always want. ‘Just join and be smart’ is one of these for instance – as if older adults are constantly dredged down by inefficiencies in their life which could be solved if they only embrace the endless contacts and capacities of technology. Schoenmakers explained that older adults are often represented as frail and lonely and they should be pitied and helped. However, it turns out that older adults often belong to the happiest demographic. While biological decline may set in, social and psychological decline doesn’t have to. Instead loneliness should be approached differently. Loneliness is mostly dependent on expectations, Schoenmakers explained. It arises when the relationship that is wanted does not matches the one that is experienced. Understanding loneliness then takes a more contextualized analysis that looks at the changes occurring in the older adults’ life and what shapes their expectations, which is more networked than individualistic. What contributes to the loneliness is that older adults are treated as if they are impotent while many are still able bodied and motivated. This isolation denies them a function in society thus abolishing all expectations. Basically, the older adults are denied agency, meaning “allow[ing] players to manage or alter the political, social, economic, or cultural structures of the … world” (Raphael et al. 2010, 212). By imposing solutions on the older adults their influence on their life is taken away. Housing is a central issue in this. When having to leave your house full of memories for a geriatric home, an important link is severed. The same goes for older adults not being able to pay for their house now that families are smaller and rents are going up. The key, Schoenmaker says, is to treat them with dignity. Instead of a priori ignoring their expectations allow older adults to strive for them themselves. That’s why Schoenmaker prefers the term ‘older adults’ instead of elderly because this makes them a gradation of functioning individuals instead of a separate category. An exemplary approach to the older adults of Woensel Noord is provided by the Vitalis care group, as presented by Maaike Mul. Instead of organizing standard activities for older adults – labeled appropriate for that demographic like knitting, bingo, etc. – her organization focuses on what the older adults have to offer. By relying on the skills already gathered and facilitating the formation of social groups around a passion, the Vitalis care group ensures that older adults come together and integrate into a participation society. Instead of simply addressing the proximity issue of loneliness, these initiatives thrive on passions, which gives the older adults agency over their lives and allow them to manage and shape their own expectations. As seen in the previous Games for Cities events communication between stakeholders such as the municipality, the older adults, and the game designers should be reconciled. The inclusion of soft data and the streamlining of the interviews are then structuring the game designs. Furthermore the audience must be taken into account when designing games. The more dignified approach to loneliness can be used as guideline for game designs. With these considerations in mind the role of games for cities can be discussed. [G]ames may be used to engage people in the actual planning and design process itself through simulation, feedback and using outcomes in actual design” (2015, 430). This characteristic caters to the focus on citizen initiatives as expressed by Mul as well as a feeling of agency stressed by Schoenmakers. Games can then actively contribute to the functioning of the neighbourhood by appealing to its citizens – a necessity given its current functional mismatch. “[G]ames allow people to act on a wide range of specific urban issues through role-playing, building trust, forging collaborations and tapping into crowd creativity” (ibidem). Here is where experimentation comes in. Instead of scripting encounters for older adults, a lot should be left free for them to fill in. Managing expectations in games can be done by playing out a scenario and see how it turns out. Miguel Sicart accredits play with an experimental and personal nature in general, as well as cherishing its appropriative nature (2014). According to Sicart, playing a game allows players to make the situation their own – to tell their own story and testing their own skills. These are exactly the elements Schoenmakers identified as lacking for lonely people. “[G]ames are used to stimulate playful encounters and interactions with other people and places by stimulating serendipity and fun” (de Lange 2015, 432). Next to providing social contacts based on proximity, games are able to draw in players that usually would not engage in urban issues. Socially isolated citizens can thus be involved and granted agency again. This characteristic of urban games is especially useful when addressing older adults, who are not known as the most gameful audience. An older adult member from the audience stated that he’s not interested in more social contacts, so the social character of games does not appeal. Instead, he’s interested in higher quality meetings with his familiars, an audience specific demand games and play with their fun and serendipity can definitely be shaped after. The talk show then allowed the game designers to come to grips with the themes, the audience, and their desires: loneliness, older adults, and a whole range of personal expressions. There are many ways to work with the insights gathered from the talk show. These insights show in general what games can do and why they are useful, even for a non-gaming audience. But the form the games will take, what kind of data should fill up the data deserts, and how the older adults will addressed in the game is still open to the designers. A key theme to explore is the site specificity of loneliness. Will the design teams make tools to battle loneliness everywhere or should this game jam provide games fitted solely to Woensel Noord? The talk show provided the parameters and the motivation to use games, what rests is the design. Hajer, Maarten A. 2016. ‘On Being Smart about Cities: Seven Considerations for a New Urban Planning and Design’. In Untamed Urbanisms, edited by Adriana Allen, Andrea Lampis, Mark Swilling, and International Social Science Council, 50–63. London: Routledge. Hollands, Robert G. 2008. ‘Will the Real Smart City Please Stand Up?’ City 12 (3): 303–20. Raphael, Chad, Christine Bachen, Kathleen-M. Lynn, Jessica Baldwin-Philippi, and Kristen A. McKee. 2010. ‘Games for Civic Learning: A Conceptual Framework and Agenda for Research and Design’. Games and Culture 5 (2): 199–235. Townsend, Anthony M. 2013. Smart Cities: Big Data, Civic Hackers, and the Quest for a New Utopia. New York, NY: W.W. Norton & Company, Inc.